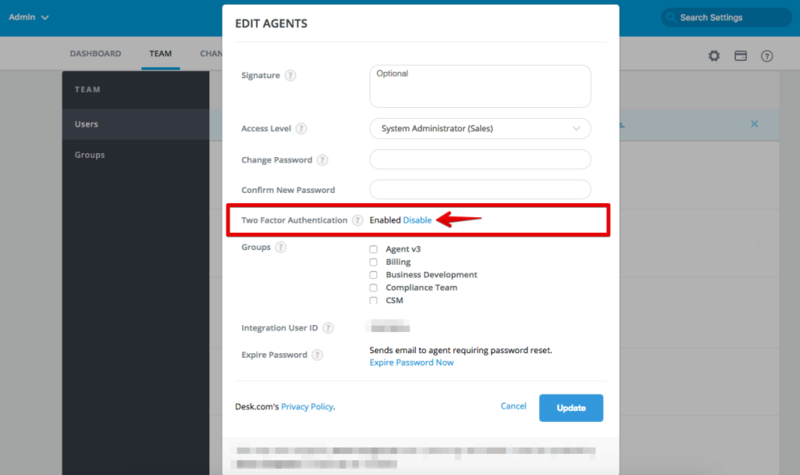 How to disable Two-Factor Authorization in Desk.com? To migrate from Desk, you’ll need to disable Two-Factor authorization. Desk.com uses Basic Access Authorization. This means that for authentication, you can use the same username and password that you use when you log in to your help desk. However, Two-Factor authorization will not allow our service to connect with Desk via API. This action requires the Administrative Manager access level or above. 1. Go to Admin > Settings > Site Settings. 2. Turn "Enable 2 Factor Auth" Off. 3. Click Update to apply the changes. 1. Go into Admin > Team > User and then find the Agent or Admin you would lik e to reset. 2. Now click on their username to load the edit box. 3. Scroll down to Two-Factor Authentication and then click on "Disable".